When patients begin to have chronic tension-type headaches more than 15 days a month, then it is necessary to avoid the medications mentioned in the acute treatment page. This is because overuse of any pain medication can lead to rebound headache where the pain medicine itself causes the headaches to continue. These headaches are the hardest headaches to treat. The most commonly used medications to treat chronic tension-type headaches are the older tricyclic antidepressants, particularly Elavil (amitriptyline). The difficulty with this medication is it tends to cause significant weight gain. 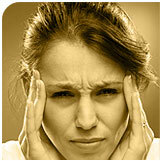 The best studied medication to prevent chronic tension-type headaches is Zanaflex® (tizanidine). The newer antidepressants classified as “SSRI’s” (Selective Serotonin Reuptake Inhibitor) are also popular to use. They may cause some weight gain but this is less common than the older tricyclic antidepressants and to a smaller degree. The best studied medication of this class is Prozac® (fluoxetine). Prozac® has the advantage of also being available in a once weekly dose. At present, the weekly form has not been studied for use in treating tension-type headaches so Dr. Loftus prescribes the daily dose for his patients until the headaches are under control and then switches to the weekly dose. If a patient fails the more common treatments above, both Neurontin® and Botulinum toxin (Botox®) are gaining use. Neurontin® is the safest of all of the oral medications used for this condition and therefore will sometimes be used first if a patient is taking a significant number of simultaneous medications. Botulinum toxin has even fewer side effects but costs substantially more and is rarely covered by insurance companies for the treatment of headaches. It also has to be repeated every 3 months. The high cost of botulinum toxin is one reason why it is used less frequently than other options.